Interview: Switching from an Amish school girl to a distraught widow to a troubled killer, Sadieh Rifai portrayed the entire cast of Jessica Dickey’s “The Amish Project” at American Theater Company. 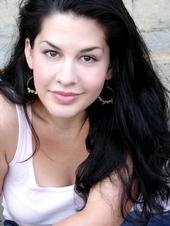 Sadieh Rifai thought Jessica’s Dickey’s play “The Amish Project,” which closed Oct. 30 at American Theater Company, would be a pretty straight-forward one-woman show. The young actor would be switching among seven characters, but she didn’t see that as a big deal. She was in for a big surprise. Audiences transfixed by Rifai’s multi-strand narrative, about one troubled man’s murderous assault on a group of Amish school girls in 2006, are witnessing a theatrical tour de force. They might never guess just how challenging the project proved to be. They aren’t supposed to. That’s what makes Rifai’s performance so remarkable. In “The Amish Project,” Rifai portrays a little girl, her older sister, the widow of the killer, a teenage Puerto Rican girl who lives in this Pennsylvania community, a non-Amish woman outraged by the massacre, a non-Amish scholar of Amish culture and the killer, Charles Roberts, a milk truck driver whose route included the village of Nickel Mines, PA.
On Oct. 2, 2006, Roberts entered an Amish schoolhouse in Nickel Mines, ordered the teacher and all the boys out at gun point, then bound and shot 10 little girls, killing five of them, before taking his own life. The Amish community’s reaction was a collective expression of immediate forgiveness, extended personally to the gunman’s widow, Carol Roberts. 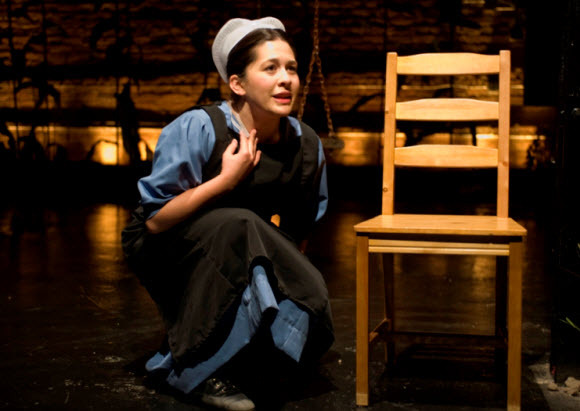 The play deals with this gesture of grace, the stunned widow’s difficulty in accepting it and perspectives on the incident from the viewpoints of two Amish girls and non-Amish townspeople. Of all the characters, says Rifai, she enjoys most playing the one we see first, the younger Amish child Velda. From Velda, Rifai modulates into her older sister Anna, with a distinct change of bearing, facial expression and even language: “I go to more of a Pennsylvania Dutch accent so the audience can see plainly that it’s a new character speaking.” She said director PJ Paparelli, who is also ATC’s artistic director, wanted to make the early transitions deliberate and clear – because the changes pick up speed like an el train moving out of the station, until Rifai is switching characters between breaths. And somehow we never lose our place in her narrative. If it’s the little girl Rifai has enjoyed most, the character to whom she feels closest is Carol Roberts, the killer’s widow, who in this re-telling of the historical events comes home to find members of the Amish community bearing forgiveness and offerings of food. Rifai and Paparelli also came up with a vocabulary of visual cues that proved especially useful in the early going of this hour-long monologue. By stepping around a chair, picking up a cup of coffee, lighting a cigarette, Rifai telegraphs that she has become someone else. It isn’t just a matter of not confusing the audience. Rifai says she wants the viewer with her and engaged in the most active and emotional sense. To get not only America’s accent right, but that of every other character as well, Rifai worked with a dialect coach. And to get a grasp on the Amish culture, the actor, director and other members of the creative team traveled to Nickel Mines where they visited the memorial site of the schoolhouse and the burial site of the five slain girls. They also went to the new school, consulted with non-Amish folks in the area and visited with members of the Amish community. And an extraordinary dramatic achievement. Rifai says she warms up her voice for 20 minutes before each performance – then goes through the entire play before coming on stage. But the actor also has the most improbable of day jobs: answering the phone as a customer service representative. Review of “The Amish Project”: Read it at Chicago On the Aisle.